Okay, so this week's recipe isn't entirely new. But the filling is! I made ravioli before, when Lorelei and I were getting ready for the Shamrock Shuffle back in April. Those were eggplant and goat cheese filled. The filling was one medium eggplant, roasted and scraped out from the skin. Add that to a sautéed mixture of six ounces of browned hot Italian sausage (if I could find turkey sausage out here, I'd use it - had to use pork this time) and eight ounces of finely chopped portabella mushrooms, stir to combine, and let cool enough to work with easily. 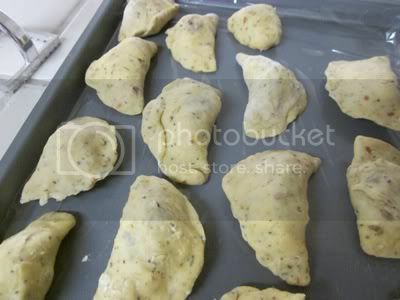 Fill the ravioli, then place them on a cookie sheet and flash freeze them. Put them in plastic bags in individual servings for quick lunches or dinners - when you cook them, they'll take 4-5 minutes in boiling water, or until they float to the top. 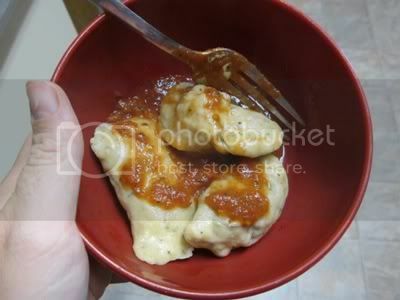 I put the recipe into MyFitnessPal - my batch made 33 ravioli, so they worked out to about 65 calories per raviolo. (Did you know that was the singular of ravioli? I miss taking Italian.) Totally delicious. A bit time consuming, yes, but worth it. The reason I made them on Saturday is because I am having dinner with one of my new California friends on Monday. His name is Justin, and he not only works at the university, but lives in my apartment complex. We met shortly after I moved in - he was in the pool with a couple of his co-workers (Adam and Menal) and I was in the hot tub with my dad. We got in the pool to cool off while they went in the tub to warm up; when we got out of the pool, they said we could join them in the hot tub if we wanted. We got to talking, and that's when I found out they all worked at the university. A couple of days later, I was in the hot tub again when Justin came over and sat down alongside. He was doing laundry in the office nearby and saw me so he came over to ask how things were going. He said everyone was getting together for dinner at Adam's the Wednesday that week if I'd like to join them. I said sure, and he asked for my number to let me know when we'd be meeting up. The day before our group dinner, though, he texted me and asked if I wanted to go swimming that night. I said sure, and we hung out for a little while, drinking beers and talking in the hot tub. Somehow it came up that I don't know how to drive, and he said he'd teach me. He asked what a good payment would be, and I said I'm a pretty good cook. He seemed pleased, so I will be cooking for him - one dinner per driving lesson. Sounds fair to me - I love cooking for people, and as much as I love biking, I definitely need to learn how to drive. So lesson one's meal will be funded by homemade ravioli. Hopefully he likes them so I can continue to learn how to drive for far less than a driving school would charge - not to mention the spared embarrassment of having to sit with a bunch of teenagers and learn about street signs. What about you? What's your favorite ravioli filling? How old were you when you learned how to drive? Those ravs look delish. And I had no idea that the singular form is "raviolo"...and I'm an Italian English teacher...wow! That's sad. I love the meals for driving lessons idea. Brilliant! Win-win-WIN! I feel like he's totally hitting on you! NO NO? HAH. I was 15-16 when I learned to drive, but almost 17 before I got my lisence. Driving scared me. My 15 year oldbrother called to make me an appointment at the DMV. the basic premise of driving is simple enough: stay between the lines and don't hit anything. Favorite ravioli: sweet potato with sage butter. Labor intensive but totally worth it. Definitely a win-win....great idea for a swap!! I learned how to drive at 16....I totally couldn't wait.. The minute I turned 15 I got my drivers permit and then the second I turned 16 I got my license. My first car was a 4 speed and I learned how to drive with this car...Hills were a little unnerving!! You can so do this!!! Keep focused on your health & fitness journey! My favorite would probably be spinich, ricotta and a little bit of beef or pork. I learned to drive at the standard 16 years old, however, if you ask my man he'd probably tell you I drive bad...which I totally dont...I just dont like backing up and get stressed easy haha. ugh I absolutely hate driving! I never wanted to learn! Sounds yummy! I was 15 when I learned 16 when I got my license! Im 28 and I've still yet to learn to drive. I've never really needed to learn because my school/college was near my house and my work was 20 minutes away too (before it moved). I guess because the UK is so much smaller, it's a lot easier to get from A to B using public transport. I learned to drive at 16. However, the driving test was a monster. Weaving my big 1973 gas hog between the cones was sheer madness. I was a two time tester before I finally passed. The Barter is a very good and cute idea. Wow, that ravioli looks/sounds delicious. Is there a bad ravioli filling? I couldn't wait to drive and took driver's ed at 14 and had my license at 15. I'm definitely making these ravioli!! I'm so glad you're getting settled where you are, hon! And hey, solidarity on the not-driving-yet. Me too! I too, was a bit older before i got my first car. I had my provisional license and the written part of my test done when i was 17, but i didn't get round to buying a car and doing the exam until i was..hmm, about your age i think, yep, about 24 or 25. It sure cost me a bit more in lessons than ravioli!! Yumm recipe!! I have never lived in a world where folks talk of pasta in the singular. Yeah, that feels roughly the same. I learned to drive when I was 9. In a manual Luv truck out in the desert (which you will probably go to now that you are a caligirl). My fave innerts to a ravioli? I like spinach, cheese and nutmeg and I also like butternut squash then sauteeing them in brown butter - maybe with some hazelnuts and sage. Decidedly undietetic. But the spinach one could be. I make my own ricotta with skim dairy. I love that you have lucked into a nice group of people to live and work with. You HAVE to drive in CA. HAVE TO! I suggest a stiff drink for both of you after your first sojourn onto the freeway.